The weather this past weekend was beautiful and according to the weatherman, it's sticking around for the week. Who else is ready (and excited) for warm Spring weather?? Today's giveaway from Razzberry Fizz fits right in with the 'Spring is in the air' motto this week. Razzberry Fizz would like to give one lucky Clemson Girl reader a monogrammed cooler tote in one of their many fun patterns. These fully insulated and lined bucket shaped cooler totes are great for the beach, poolside, or tailgaiting. The laminated woven cotton exterior easily wipes clean with a damp cloth. 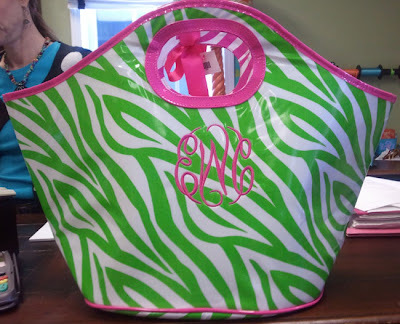 These totes from Razzberry Fizz are so cute - I am SO ready for warmer weather! 1) Post a comment on this blog post with your first name, last initial and where you are from -- one entry. 2) Become a fan of Razzberry Fizz on Facebook and post another comment on this post and mention that you are a fan -- one entry. 3) Share this giveaway with your friends on Facebook, then post another comment on this post letting us know you did -- one entry. 4) Email a link to this giveaway to two of your friends and copy us (clemsongirlblog@gmail.com) -- one entry. That's a total of four possible entries! Deadline for all entries is NOON tomorrow, Tuesday, March 15th. We will compile all of the entries, randomly draw a winner, and announce the winner on the blog tomorrow afternoon. I am a fan of Razzberry Fizz on FB!! :) Love these totes! I shared the giveaway to my FB friends and posted the link to my FB! I like Razzberry Fizz and would love to win the tote! 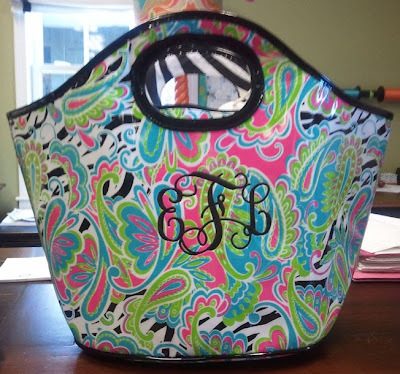 Became a fan of Rzzberry Fizz and would love to win the very cute cooler tote! Oh, and I'm a fb fan! Nicole A. Pendleton, sc I have been a fan of razzberry fizz on facebook for quite some time!! I am a fan of Razzberry Fizz on Facebook!! I told all of my facebook friends about this giveaway by posting it on Facebook! I'm a fan on Facebook, and I shared the link on Facebook! I am a major Razzberry Fizz fan! I am also a fan of Razzberry Fizz on Facebook! Nikki C. Pickens, SC-Thank you for the opportunity! I am a fan of Razzberry Fizz on Facebook already. Love it! I love this tote...it's so cute and great that it's insulated! Tara Hill, Raleigh NC-Shared the giveaway post on FB with my friends. Love the Fizz and Clemson girl! Amber T. from Aiken, SC. Also a fan of Razzberry Fizz! Beth C. Richburg, SC. I follow Razzberry Fizz on FB! Love this item! Nancy W. Richburg, SC. I follow Razberry Fizz on FB! Thanks! I'm a fan of Razzberry Fizz on FB!!! These totes are so cute! Laura P gilbert, s.c. I love these totes! Enter me please! Chapel Hill, NC; such a cute giveaway! E-mailed 2 friends the link. Fan of Razzberry Fizz on facebook. Shared the link to the giveaway on FB! Now all my friends know about these awesome totes!!! Love the tote; really cute. It's perfect for just about anything! I am a fan of Razzberry Fizz, shared on Facebook, and commenting on the blog! I love your blog! Fan of Razzberry Fizz on FB! The zebra tote is amazing!! Love it! I liked Razzberry Fizz on Facebook! I am a fan on Facebook now! Cara L.
I am now a fan on FB too. I'm a fan of Raspberry Fizz on FB! I love Razzberry Fizz; it's always my first stop when looking for gifts! Is now a fan of Razzberry Fizz, and posted this link on my facebook! I am a fan of RF on facebook. Would love to win this tote! I have heard the Razzberry Fizz is a fabulous place. The next time I am up there I will have to hit it up!!! I'm a fan of Razzberry Fizz on Facebook. Melanie R. from Clemson, SC .... loves these cute totes! Love Razzberry Fizz! I'm a FB fan! OMG! These are to cute!!! I love them!!! These are absolutely adorable! Perfect for any occasion!! Kellie k from clemson!! !These totes are so dang on cute!!! These are so cute and would be perfect for a Spring Break trip. I am a fan of Razzberry Fizz and shared the giveaway link! I am a fan of Razzberry Fizz on Facebook. YEA!!! I have shared this link and give away information as my status on FB! Hoping for a win! Rachel P. From Chapin, SC - Love it! Love these totes!!! So Cute!!! I became a fan and shared the link on facebook! I'm a fan of Rasberry Fizz on Facebook! I also became a fan of Razzberry Fizz on Facebook! I also shared this giveaway with my friends on Facebook. I'm a fan of razzberry fizz on fb! Love the Razzberry Fizz. It is a great tote. I linked up to share the give away with my facebook friends!!! Huge Clemson fan who is going to be moving to the area this summer. Would love to know about local cool stuff like this. Alana P. Florence, SC I love the tote! I am a fan of Razzberry Fizz. I am a fan on facebook, shared y'all on facebook and e-mailed two friends! YAY! I am a fan of y'all on facebook! I love Razzberry Fizz and all their cute items. I especially love the totes! Just shared the giveaway via facebook!! Jessica M Powdersville, SC and I am also a fan of Razzberry Fizz! Been a fanof Razzberry Fizz for a while:) also shared the link! Just shared this with all of my Clemson girl-friends! What a fun pattern and really neat gift! I have never heard of Razzberry Fizz,but plan to be a fan!Go Tigers!!! I have never heard of Razzberry Fizz before, but I love it!!! shared with all my FB friends!! Go Tigers!